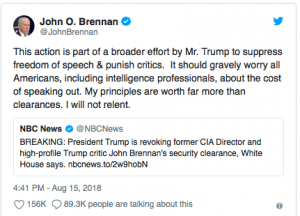 What exactly did John Brennan and the CIA do? They gave Kris Paronto and another survivor NDAs to sign at the memorial service for their comrades, Ty Woods and Glen Doherty. Not only did they do that but then Brennan lied that they did that. Two former CIA officials who fought in Benghazi on September 11, 2012, were asked to sign additional nondisclosure agreements (NDAs) more than six months after those attacks. The two officials, who will testify Thursday before a subcommittee of the House Permanent Select Committee on Intelligence, were presented the nondisclosure agreements during a memorial service in May at CIA headquarters in Langley, Virginia, honoring Tyrone Woods and Glen Doherty, two of the CIA-affiliated personnel who died during those attacks. CIA officials have rejected persistent accusations that the Agency has sought to keep Benghazi survivors from sharing their stories. 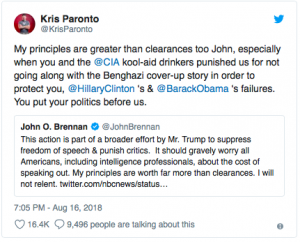 In a letter obtained by THE WEEKLY STANDARD earlier this fall, CIA director John Brennan categorically denied claims that the CIA discouraged its operatives or contractors from speaking out about their experiences.